In The Run, players are participating in an "underground world of illicit, high stakes racing," in a race from San Francisco to New York, with stops through Las Vegas, Denver and many other locations, making it the first title in the series to use real locations. The cops aren't the only ones after the player though, as the player "blows across borders, weaves through dense urban traffic, rockets down icy mountain passes and navigates narrow canyons at breakneck speeds." There are over 300 km(186 miles) of track, three times more than Hot Pursuit, making it the biggest Need For Speed game. 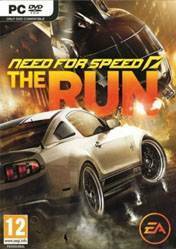 The Run is powered by DICE's Frostbite 2 engine, making the game the first non-shooter and one of the first console titles to use the engine, which provides visuals and car physics that "hug the road even at top speeds all built around a gripping storyline." Additionally, Need for Speed Autolog, the Need for Speed franchise's social competition functionality, which was introduced in Hot Pursuit and was previously used in Shift 2: Unleashed, is also back as it continue to track career progression and compare game stats.